The MTM55PL-S provides a safe way of maneuvering your TV around any home or office setting. Its steel frame is quick to assemble and features 2-inch rubber casters to smoothly roll it between locations. Along with a steel top shelf suitable for a webcam, this mobile stand comes with a steel component tray that provides a strong and stable surface for your laptop, gaming console, or other AV equipment. It also features telescopic center columns that offer 20 inch of height adjustment and include integrated cable management for an exceptionally tidy setup. To ensure your TV and accessories remain secure, each wheel includes a quick release lock that can be easily applied and released with your foot. Ideal for homes, schools and offices, the MTM55PL-S safely supports TVs up to 80 pounds. Designed for most 32 inch to 55 inch TVs, the mounting brackets fit virtually any VESA pattern from 75×75 to 600×400. Includes a top shelf and adjustable steel tray to carry your devices. Height adjustments are made easy with two buttons located on the center columns. At 2 increments, place the center of your TV anywhere between 38 inch and 58 for optimal viewing. This heavy-gauge TV mount has high standards, holding 26 in. - 55 in. TVs weighing up to 60 lbs. You can install on a single wood stud with easy 30-minutes. We've got you covered with all hardware included and pre-divided. Pulling out to 16 in. and back in to 2.9 in. from the wall gives your TV smooth moves. Effortless 180 swiveling capability gives you the best view from any seat in the house. 15 tilt capability makes adjustments easy. The PF300 provides a low-profile solution to mounting your flat screen TV. Designed to support 150 pounds, its 27-inch wall plate ensures an easy installation on both 16 and 24-inch stud centers. The mounting brackets come equipped with adjustable screws to facilitate precision leveling, Torx screws to protect against theft, and quick release cords for easy removal of your TV. Along with a 6-inch extension bit to conveniently access the security and leveling screws after mounting your TV, the PF300 comes with all the necessary hardware for wood stud and concrete installations. The FMX3 is designed for flat screen display's measuring up to 90" and weighing less than 150 lb. This full motion mount gives you amazing range of motion, letting you enjoy your TV to the fullest. Featuring up to 28 of extension and coming pre-assembled with dual heavy-duty steel arms, the FMX3 is simple to install and offers incredible extension, tilt, and swivel capabilities. Flexibility in a small package. This VESA-compliant TV mount has carved a niche for itself in offices, kitchens and other spaces where a smaller TV is generally more appropriate. The L102 features an articulating arm capable of reaching up to 17" from the wall, full swivel capabilities and generous tilt to position your TV wherever you'd like it. MTM55PL-S Mobile TV Mount with Adjustable Steel Tray for 32-inch to 55-inch TVs The MTM55PL-S provides a safe way of maneuvering your TV around any home or office setting. Its steel frame is quick to assemble and features 2-inch rubber casters to smoothly roll it between locations. Along with a steel top shelf suitable for a webcam, this mobile stand comes with a steel component tray that provides a strong and stable surface for your laptop, gaming console, or other AV equipment. 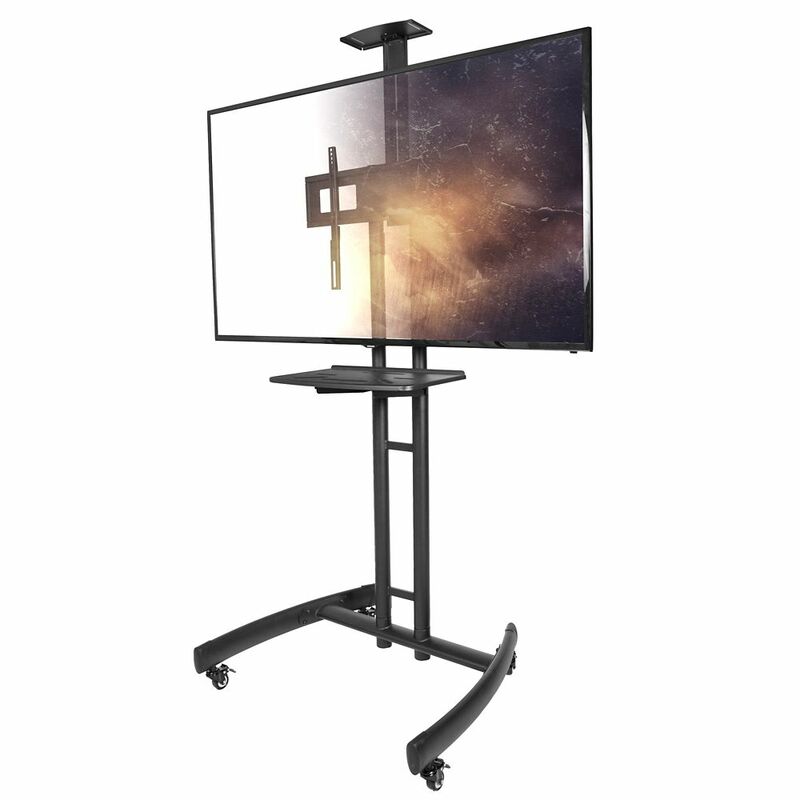 It also features telescopic center columns that offer 20 inch of height adjustment and include integrated cable management for an exceptionally tidy setup. To ensure your TV and accessories remain secure, each wheel includes a quick release lock that can be easily applied and released with your foot.